The Field Gallery was established in 1970 and construction was completed the following summer. The original barn-like structure was constructed by friends, passers by, summer house guests, and curious day trippers, all volunteering their time! It was a labor of love for four artists and their families. Designed by architect Robert Schwartz, the Gallery was conceived originally as a co-op by Thomas Maley and friends who wanted a special environment in which to exhibit their art. Little has changed over the years as the gallery continues to host an impressive group of talented artists. Though no longer a co-op, the Field Gallery is run by a small, friendly, and helpful staff that is eager to improve your Vineyard visit. Works can be viewed in person and on our website. The Field Gallery and Sculpture Garden is an unparalleled environment. Inside, three galleries present rotating exhibits of contemporary paintings, sculpture, photography, and so much more. 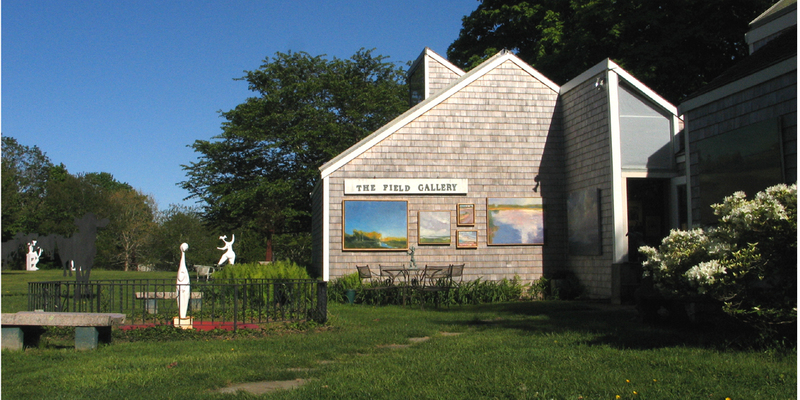 Outside, the large field is home to the ever enchanting sculptures of Field Gallery founder Thomas Maley. The gallery represents more than 25 talented artists, each with a distinct island connection. Run by a small staff, the Field Gallery is a truly unique viewing experience with constantly changing artwork and Vineyard charm. Artist receptions are held Sunday afternoons from 5 to 7 pm throughout the summer. They have become an island tradition. We invite you to join us. And while you are ‘up-island’, don’t forget to visit our sister gallery, the Granary Gallery, just down the road at 636 Old County Road. If you find yourself in the heart of historic Edgartown, visit our newest gallery, North Water Gallery, located on the corner of North Water Street and Kelley Street.